The human hands are complex and capable of a wide range of functions, including gross and fine motor movements. Gross motor movement is considered moves that allow you to pick up large objects or perform heavy labor. Fine motor movements are functions that enable you to perform a delicate task such as hold small objects, performing detailed work, such as surgeon conducting an operation. The complex abilities of the human hand are part of what make humans unique. Only humans have the capacity to bring our thumbs across the hand to connect the ring and pinkie fingers. This ability provides human with the dexterity to use tools and give us a forceful grip. The fingers – Digits that extend from the palm of the hand, the hands make it possible for humans to pick up or grip very small objects. Palm: this the bottom of the body of the hand. 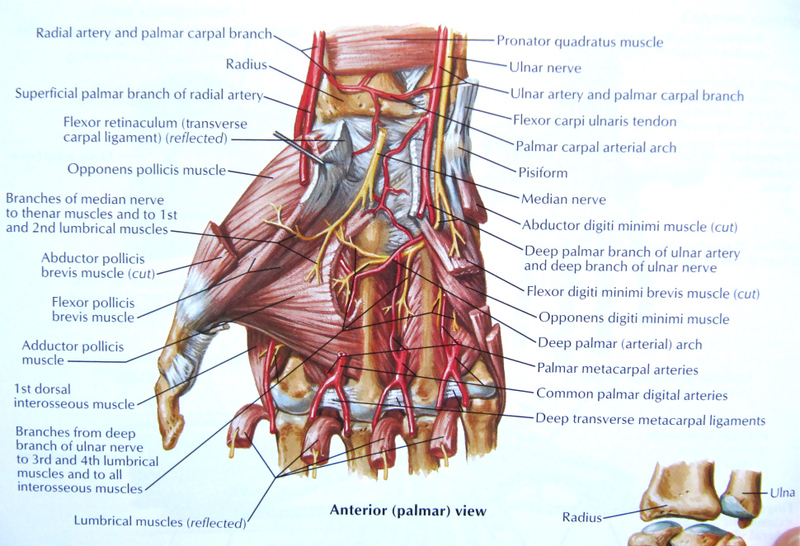 Back (opisthenar): The back of the hand reveals the dorsal venous network, a web of veins. Finger Anatomy: Unfortunately the finger is easily injured, broken fingers are the most common traumatic injury seen in the emergency room. Finger fractures account for nearly 10% of all bone features. Since fingers are used for a large majority of everyday activities for humans, they tend to be at higher risk than other parts of the body. For traumatic injury, sports injury, workplace injuries or accidents. These finger injuries are easier to understand when you know how the fingers are constructed. The fingers consist of ligaments, that are strong tissue that connects different bones together, tendons are attachments of bone and tissue., and three bones called phalanges. 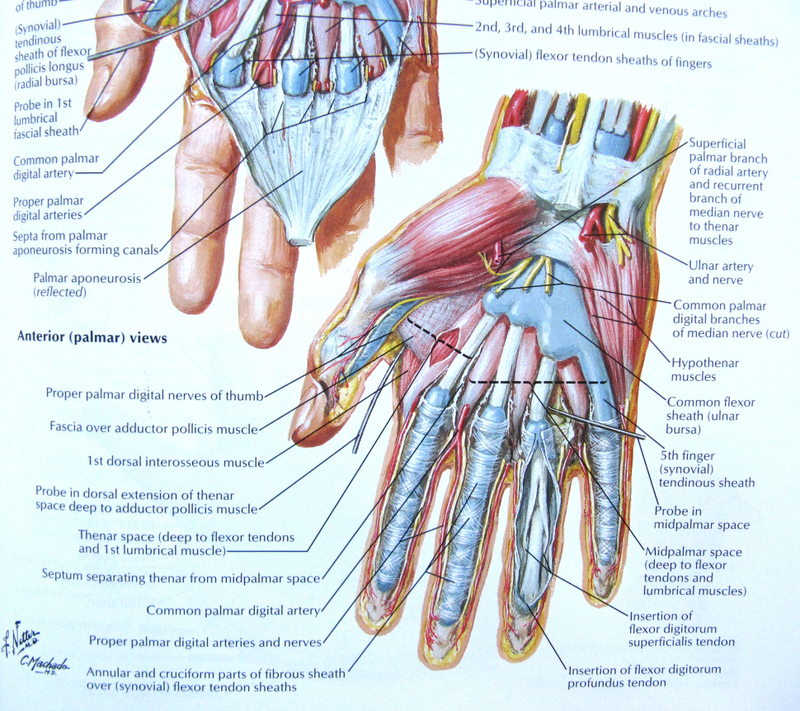 There are no muscles in the fingers, and fingers move by the pull of forearm muscles of the tendons. The three bones in each finger are referenced or named according to their relationship to the palm of the hand. Each hand consists of 19 bones. The palm includes five metacarpals, and each finger except the thumb consist of one proximal phalanx, one middle phalanx, and one distal phalanx. The thumb does not have a central phalanx. Each bone is connected by a grouping of ligaments. In hand, the distal phalanges are flat on their palmar surface, small, and with a coarse, raised surface of horseshoe formation on the palmar surface, supporting the finger pulp .In the phalanges of the hand the low, wide expansions found at the tips of the distal phalanges are called apical tufts. They support the fingertip pads and nails. The phalanx of the thumb has a noticeable inclusion for the flexor pollicis longus (asymmetric in the direction of the radial side), an ungual fossa, and two uneven ungual spines (the ulnar being more prominent). This asymmetry is crucial to ensure that the thumb pulp is constantly facing the pulps of the other digits, an osteological arrangement which provides the maximum contact surface for objects that are held by the hand. Each fingertip –distal phalanx and accompanying tissues contain a fingernail. These structures are built from keratin, a rough, sturdy protein. Similar types of keratin also make up human hair, the scales and claws of reptiles, and the claws, beaks, and feathers of birds. The palm of the hand does not contain melanin or skin pigment or hair follicles. The only other place on the body that takes both these is the sole of the fit. These two parts of the body also have thicker skin than other parts of the body. The wrist joint is a complex joint that exists between distal ends (furthest from the body) of the radius and Ulna (two forearm bones) and the carpal bones. It connects the forearm to the hand and provides a good range of motion. Repeated use does however frequently lead to injuries. Bones within the wrist is the Ulna; which is the larger of the two forearm bones. However, it tapers at the wrist end and gets narrow than the radius at the point of the wrist. The Radius is positioned on the thumb side of the wrist, and the ulna on the little finger side. The scaphoid bone crosses both the proximal and distal rows; it is the largest carpal bone. The scaphoid and the lunate are the two bones which actually articulate with the radius and ulna to of the wrist joint. 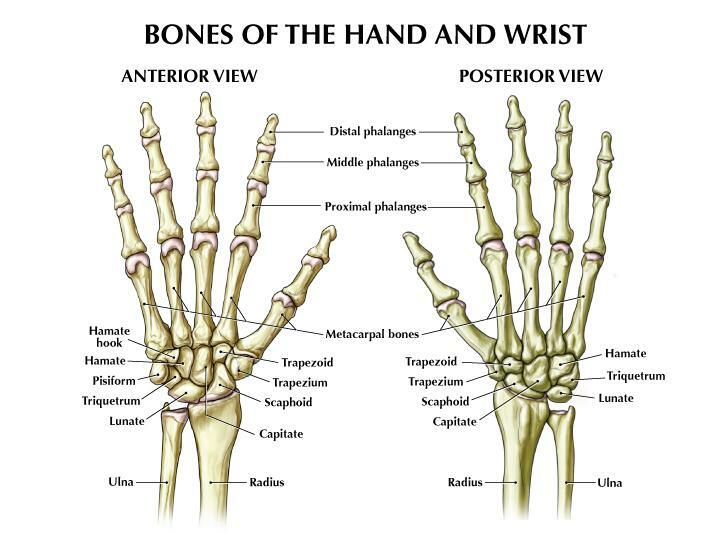 Each bone inside the wrist is joined to the next bone to it or by one or more ligaments. 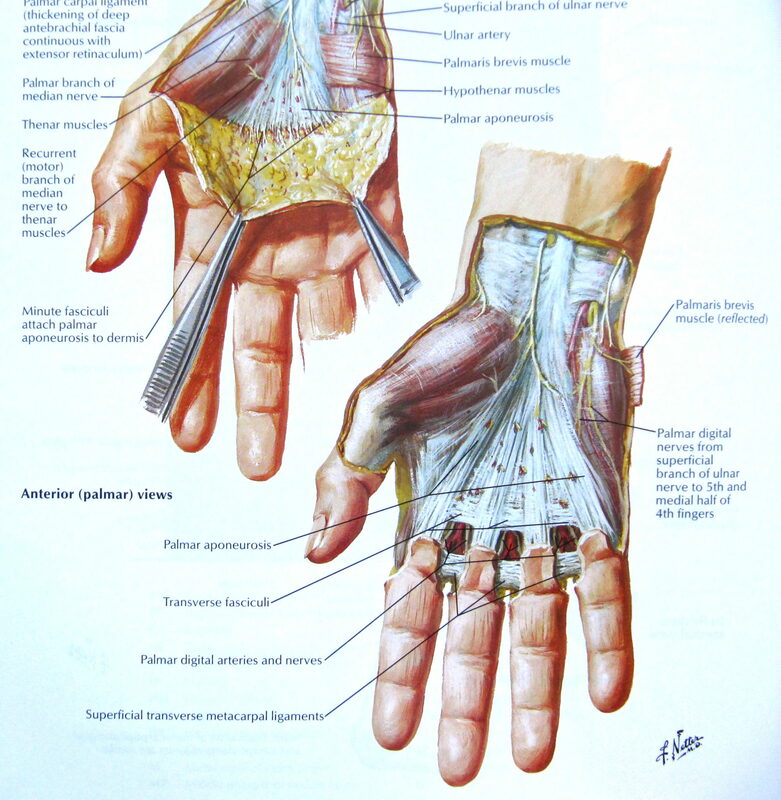 You can assume, these appears in a large number of ligaments of the wrist are the medial (ulnar) and lateral (radial) collateral ligaments, The MCL moves from the distal end of the ulnar and crosses the wrist to connect to the triquetrum and the pisiform. The LCL passes from the edge of the radius, across the joint to the scaphoid. First muscles act on the wrist joint, is situated within the forearm, with only the tendon passing the joint and inserting on the hand. The muscles on the back of the forearm (dorsal aspect) act to extend the wrist or pull it backs as if pulling a ring-pull. 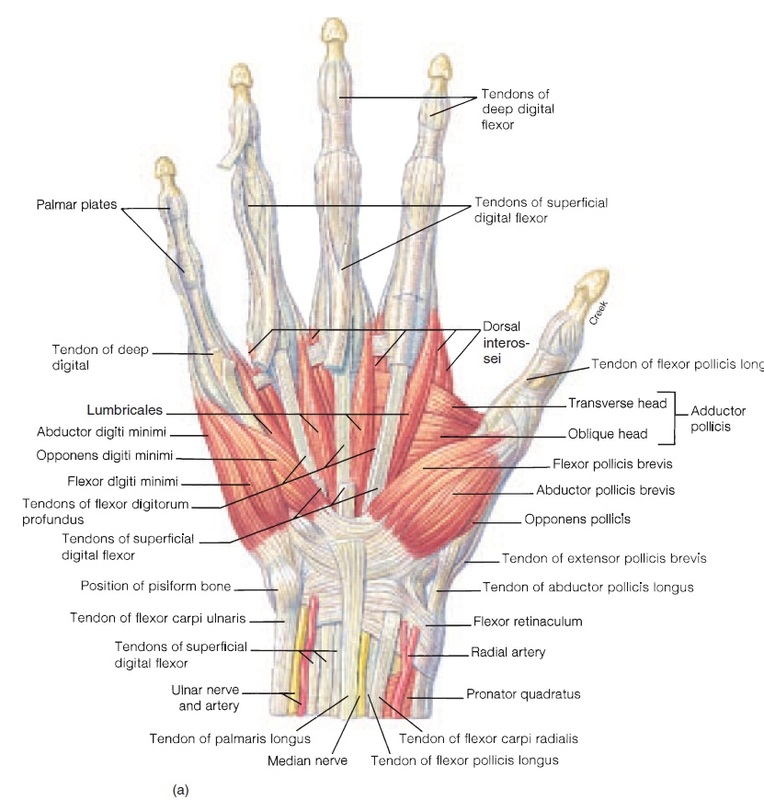 Some of these muscles can help to perform radial and ulnar deviation. Radial deviation is the act of tilting the wrist in a radical direction (or with the thumb leading) Extensor carpi radials Brevis, longus and flexor carpi radialis all perform this movement. Ulnar deviation is the reverse movement, of tilting the wrist so that the small finger leads. Extensor carpi ulnaris and flexor carpi ulnaris perform this movement. Radial nerve; The radial nerve is on the radial, or thumb sied of the wrist joint. Its provides feeling to the bank of the hand from the thumb to the middle finger. 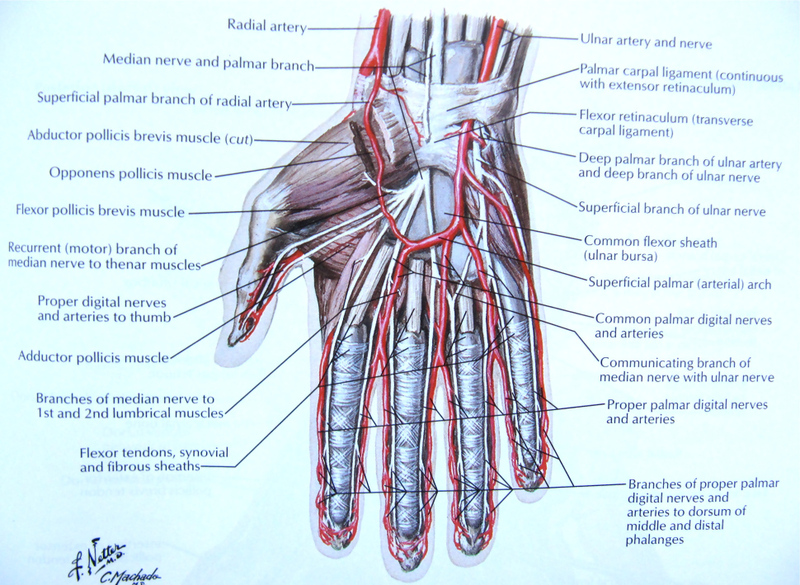 The median nerve handles the development of carpal tunnel syndrome. It passes through the carpal tunnel and splits into four branches which each travels to the thumb and next three fingers. It provides sensation to all of these fingers although only the within half of the ring finger. The ulnar nerve provides the small finger and the other half of the ring finger. Although fully functional hand can accomplish many things, they ae susceptible to a number conditions.